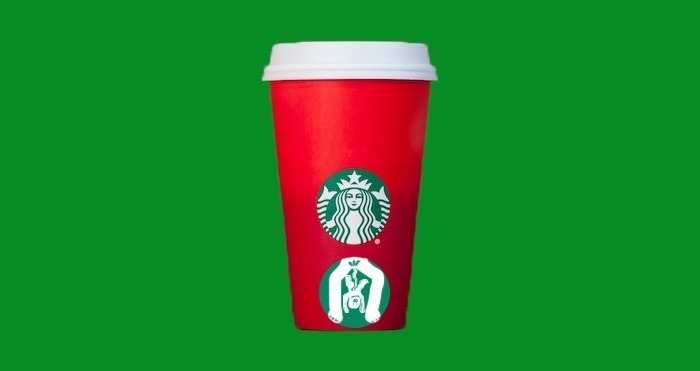 The horrifying, Christmas-hating 2015 Starbucks holiday cup. 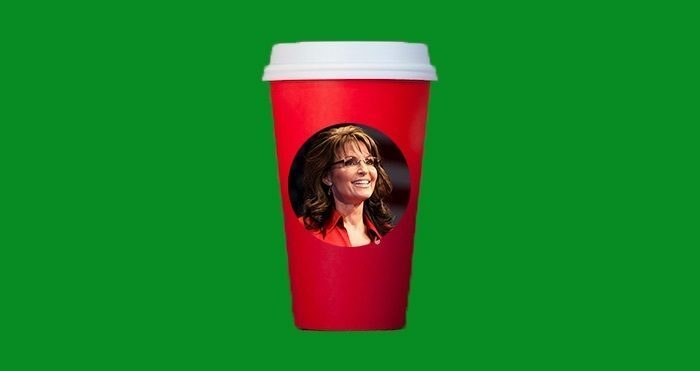 American Christians were horrified to learn this weekend that international coffee extortionist megachain Starbucks will be joining the war against Christmas with its new holiday-themed cups. 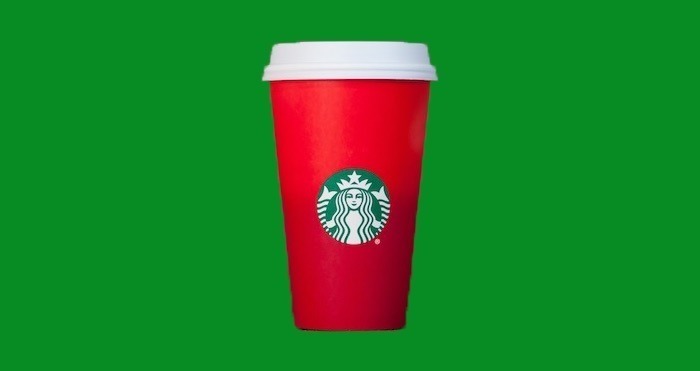 The cups are decked out in plain red this year, with no hint of a snowflake, reindeer, jolly Santa Claus, pile of gifts or other imagery that one immediately associates with Jesus’ lowly stable birth in the Middle East 2,000 years ago. Conservatives are taking this as a clear sign that Starbucks aims to take their values and use them as toilet paper in each of their store’s single, filthy unisex bathroom stall. The backlash has been so great, in fact, that the chain is already backpedaling wildly, and has announced three brand new festive Christmas designs. Starbucks gives you wings! No, literally. 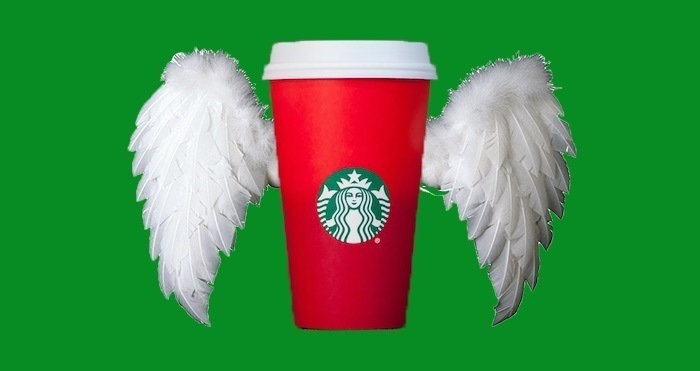 Up first is Starbuck’s new beverage container designed to remind Christians of the sterling work done by the angel Gabriel, who appeared to Mary some time in early March of 1BC and announced that verily, she had been knocked up by the Lord God himself. The cup features two ceramic wings adorned with genuine swan feathers, weighing approximately 5 pounds each and costing only an extra $75 per cup. She’ll need a coffee after that. The next design, certain to be a crowd pleaser, depicts the famous Starbucks mermaid as the Virgin Mary delivering a bouncing baby boy. Joseph, the three wise men, the shepherds and various assorted farm animals can be found on most sandwich and Panini wrappers for those anxious to create the full nativity scene. Finally, we come to an image of the savior Herself. And yay, She came to Earth to show conservative Christians the one true path, forsaking the evils of charity and love, instead embracing a rigorous program of fear-mongering, casual bigotry, and general festive intolerance. For an extra $5, this item comes paired with a Michele Bachmann salad spork.